I had another cracking night’s sleep, the double bed helped I’m sure, but the people sharing the bathroom with me did not. They were in it about 6 or 7 times in the night. I guessed they’d been in the pub all evening and were suffering because of it – I was also suffering by proxy (and lavvy flush). At breakfast Tracy the landlady also mentioned it. She didn’t seem too happy with them. But they were actually an old couple – well old – in their eighties – so perhaps bathroom usage was forgivable after all. I had the staple of Bacon and Eggs for breakfast, with tea and toast. I’ve not had a full English all walk, I just don’t seem to need that big feed in the morning anymore. On previous walks I’ve always started off with the works and ended up on Bacon & Eggs, so it seemed easier to skip straight there on this walk. The guy at Chestnut Villa in Grasmere did jokingly complain that doing Bacon & Eggs didn’t actually give him much scope to impress. Sorry fella. I didn’t see Bill for breakfast, he’s walking the Cumbria Way and only has a few short miles into Keswick to do. Like me he was making up some of the route to take advantage of short days or good weather. He’d come over the Langdales the previous day too. I’d requested a 7:30 breakfast so I could get a reasonable start on the day. It wasn’t going to be a long one, but if the weather stayed fine I wanted to be able savour it. Initially the low cloud, drizzle and cold temperature didn’t bode well for the day. I started out in wets again. Baselayer and Paramo on top and what has come to feel like the usual overtrousers over no trousers. Newspaper in my boots overnight had helped to pretty much dry them completely and I set out with warm socks straight off the radiator and the dry boots. At my first rest stop I realised why the Inov-8s had been performing so badly in the wet terrain. There was a big split in the left boot, where the sole should join the upper it was flapping loose. Brilliant. Two pairs of boots and neither pair were worth a damn. At least I’d be getting the Salomoms replaced in a few days. The route, even without maps, instantly came back to me. 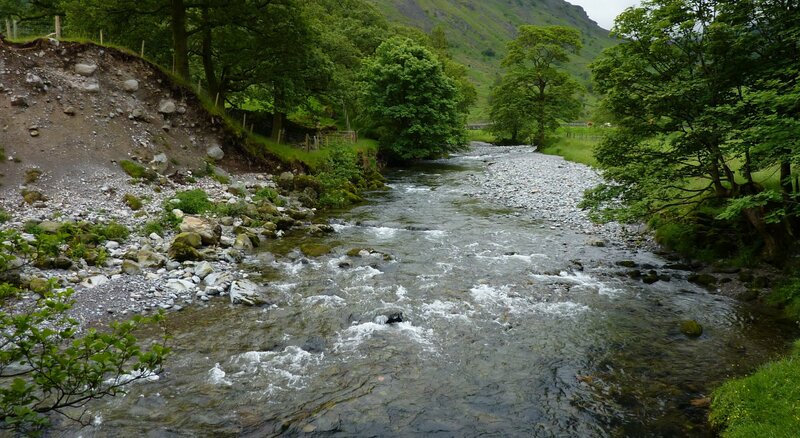 I left Stonethwaite along the road, crossed the B5289 to the YHA and then followed the path alongside the river into Seatoller. From there I turned right onto the open fell and along the grassy lane. Leaving Borrowdale, over the Derwent…. ..along the green lane out of Seatoller…. I was glad of the coat to begin, it was chilly. The tops were all covered in cloud but it seemed to be improving. By the time I left Seatoller it was getting warmer and I had a nice sweat on as I met my first westers of the day. They must have come from the hostel at Honister. They were a couple in their sixties “having our last fling, while we can” he said to me. They were carrying large packs, complete with tent and full camping gear – they’d booked no accommodation and were walking as far as they wanted then stopping; in a B&B if they could find one, or camping if not. 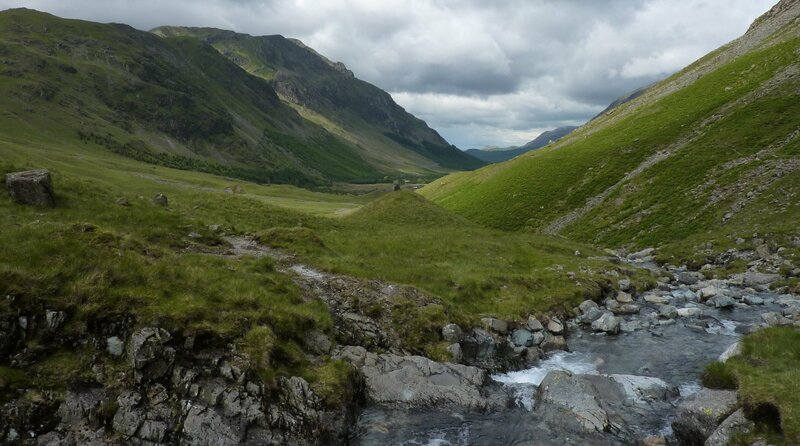 They were hoping to spend two days in Borrowdale – I was very envious. 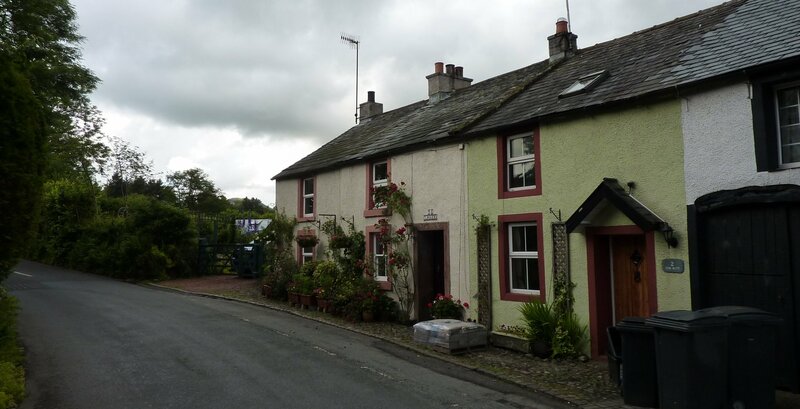 It’s a lovely place, with some of the most impressive dry-stone walls anywhere in the Lakes. That’s said only partly tongue in cheek too! I wished George and Mildred (not their real names – well not unless I’m a great guesser) a grand holiday and the best weather possible and pushed on to Honister. 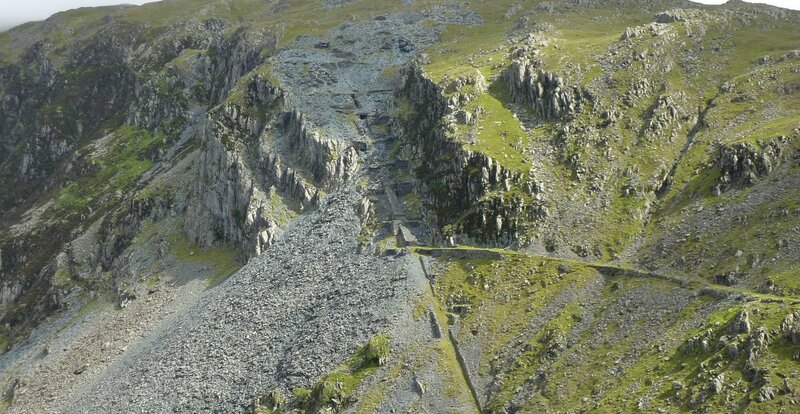 Honister mine is the sort of place I should hate, it’s commercialism personified and I hate that. But I can’t hate Honister. I was going to stop for a drink and a bun, before the steep climb up the tramway behind. Unfortunately the only cold drinks they had were water and little cartons of orange juice! They had no buns! Thwarted, I sulked back out into the thin sunlight. 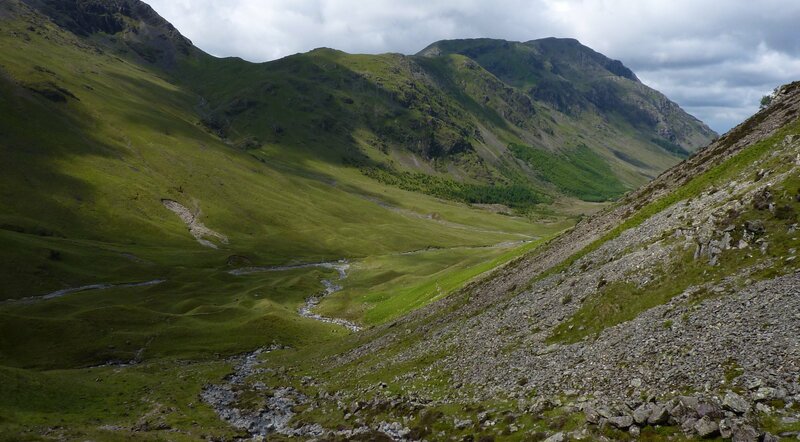 The fells were filling up, cars arriving to park at Honister and folk getting off the Rambler bus. 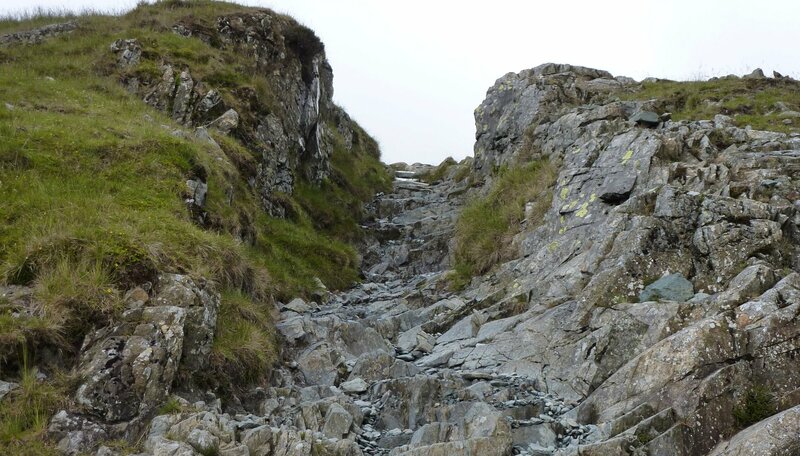 It was like a human starburst – two up the path to Dale Head, two up the ridiculously steep path to Great Gable, three up the quarry road towards Fleetwith Pike and me up the old tramway. It was definitely warming up, I sweat bullets on the steep climb, even though I was taking it very easy, not really wanting to reach the top. The views were brilliant. At the top of the climb I took a short break, took some photos and basically dragged out my time at the top of the Lakes. 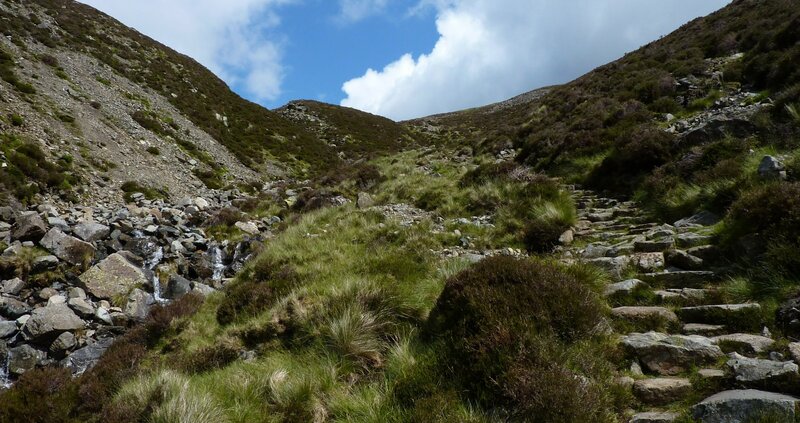 In a little while I would start descending into Ennerdale and that signified the end of the Lakes for me. 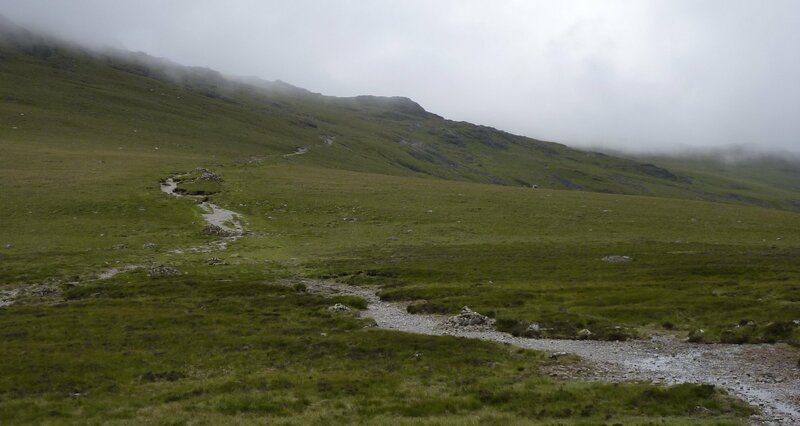 It’s a fairly dull old trudge through the valley, even with the grand hills on either side – Pillar on the left and High Stile to the right. So I took my time. I dragged my heels all the way along the path. 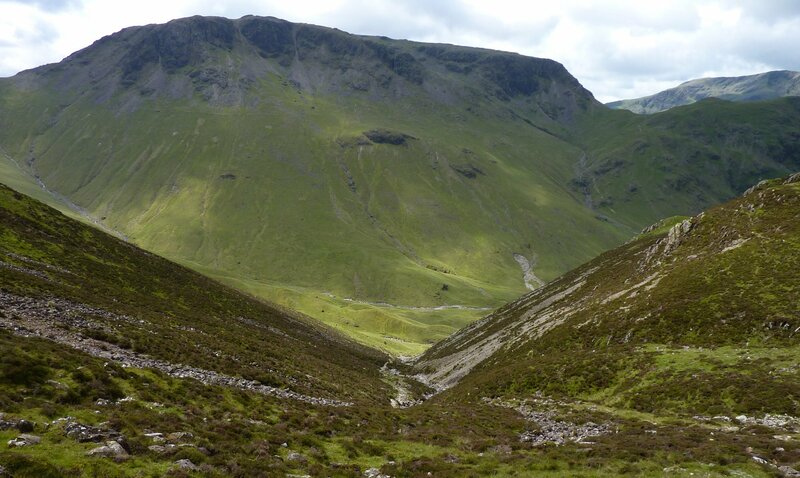 I reached the old drum house and sat for a few minutes before I took off along the thin track towards Grey Knotts. I stopped again as Buttermere and Crummack Water came into view. The weather was warming nicely now, the tops had cleared (apart from Pillar) and there was even blue sky poking through. I was completely alone. I couldn’t see another soul anywhere. Not on the paths, not on the fells. It was blissful and I sat there for as long as I was alone. It was only when I saw two walkers start out along the path from the tramway, towards me, that I moved. Can’t I stay here? Just a little longer? A few minutes later I met a young couple at the top of Loft Beck, they’d stayed at Black Sail but weren’t walking the C2C. They weren’t very chatty and soon carried on. I met a solo Aussie female two minutes later. She had no pack, just a waterproof coat tied around her waist. She seemed a little self-conscious of her lack of gear and quickly explained that one of the straps on her pack had broken yesterday and she’d been forced to send it ahead using Sherpa. She was going to have to buy a new day pack in Grasmere. The way the day was turning out though she wasn’t going to miss her pack. It was lovely now. I lingered at the top of Loft Beck for a few more minutes, then dithered and dallied and dawdled my way down the steep path. 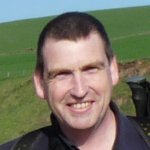 I met two older Aussie ladies on the way up – why are so many antipodeans walking this path? – I asked them how they were enjoying it and they said they’d be fine as long as there were no more steep climbs like this one. I couldn’t resist myself. “Ha, this is just a training climb, a nursery slope if you like”. I went on “tomorrow you have the climb out of Borrowdale, that’s longer and steeper than this, then there’s the climb out of Grasmere, that never seems to end and then you have the ridiculous path out of Patterdale – that’s seven miles of constant climb until you reach Kidsty Pike!” I was smiling as I reeled off their future tortures and I think they thought I was kidding. I was tired of suppressing the mischievous imp inside me! I got more photos on the descent. Pillar was looking immense and I was so glad I’d skipped the long route. I’d not have been able to bimble along on that path, I’d have had to have pushed hard all day to make decent time. I would have missed the stopping and admiring the space and the views. At the top of Loft Beck…. I followed the path to Black Sail and found the warden at the door talking to two women. I didn’t feel the need to stop; I had plenty of water (for a change) and felt like pushing on rather than killing time, now that I was down in the valley. 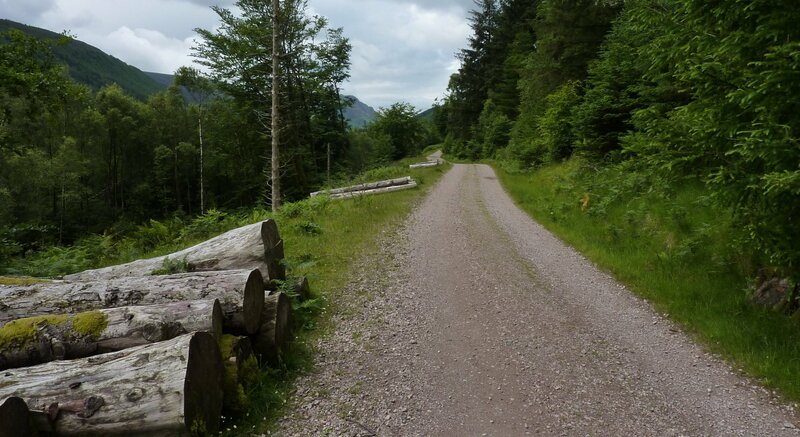 I put a kick in my pace along the road, it’s not a great place to be honest, there’s lots of felling going on and replanting and it currently looks worse than when it was just a conifer concentration camp. It will improve over time I’m sure, but that’s a few years away yet – so maybe for the next time I do the walk it’ll be worth while walking slowly and admiring the scenery. I passed a couple of dozen westers. They would have started on Wednesday, so the low numbers could be down to this – mid-week starts are much fewer than weekend starts. I’d donned headphones at Black Sail and tuned out to listen to my audiobook – so I didn’t stop to talk to any of the westers – apart from the guy who asked how far it was to Black Sail and I wasn’t quick witted enough to wind him up, instead I truthfully said about 30 mins. It started to rain at some point, but I was already in wets so I didn’t care. It didn’t last too long either. 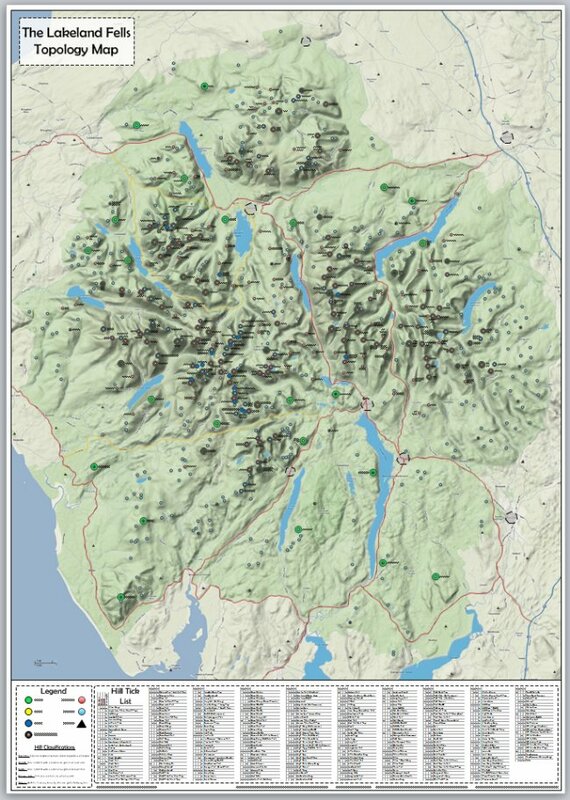 At High Gillerthwaite (Ennerdale Hostel) I decided to stay on the northern side of the reservoir, rather than cut left across the fields to pick up the stony path on the south side. I’d experienced that rocky shoreline on both my previous crossings and decided the longer path on the north side would make a nice change and may be easier on my feet. Up until Bowness car park the road is built for a Land Rover, but beyond that it becomes a nice little footpath that hugs the lake and has lots of places to stop and admire the views. I found it quite a nice change from the scrambles and rocks on the other side. If you’ve done the south side path, give the north side a go next time, it’s easy to follow and good walking. The B&B is very basic and there’s no shower, just a bath, but it will do. The couple that run it are very friendly and welcoming. I’m running out of battery on the iPhone so I’m going to have to post this and hope to finish it tomorrow. Just a couple of quick thoughts on where to eat and drink on Ennerdale Bridge for all you future C2Cers; whether you be easters or westers. The Fox & Hounds is my preferred choice for the following reasons….. The Fox & Hounds is now a village co-operative, still leased from the absentee landlord, but a local concern. We should all try and support these local businesses along the route, as per my previous comments on the White Swan. There is a much better atmosphere, even when it’s quiet. Both pubs were pretty quiet when I was in them. But the Fox & Hounds bustled with background life and activity while the Shepherds was dead; just the barmaid wiping the glasses. The bar staff are friendlier. I got a grunt from the barmaid in the Shepherds but all the staff in the Fox & Hounds were friendly and attentive. 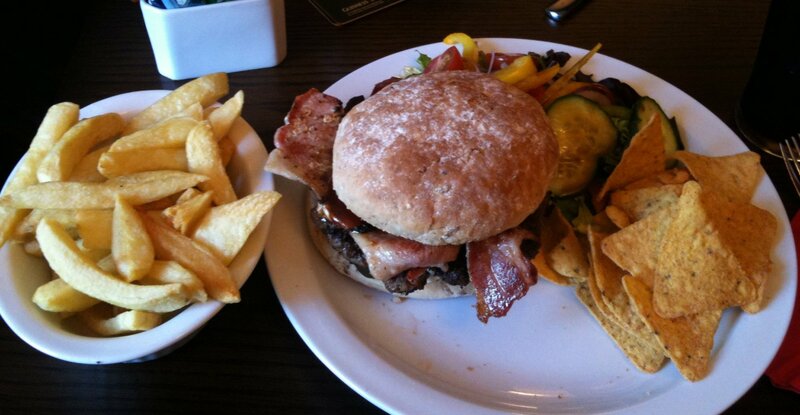 Food is served all day in the Fox & Hounds, not just from 18:00 as in the Shepherds. The food menu looks much better; it’s cheaper and has a wider choice of food. Seating is much more comfortable in the Fox & Hounds – there’s a load of comfy bench type seating with leather chairs opposite. The Shepherds is all chairs, so you can’t lounge. This is one of the biggest factors in my opinion. I felt like I was at the dinner table when I sat in the Shepherds, but the Fox & Hounds allowed me to sit up when I was eating, but lounge and stretch when I was finished. There’s better WiFi – and it’s free if you ask for it – in the Fox & Hounds. I got a good signal in all parts of the pub. The Shepherds was patchy in the bar. I stopped in the Shepherd’s for a drink on the way to the B&B. It may be 15p cheaper for a pint of Diet Coke, but there was no atmosphere at all. For me, hands down, the Fox & Hounds wins in the village. Just my personal opinion of course – I have no axe to grind either way. 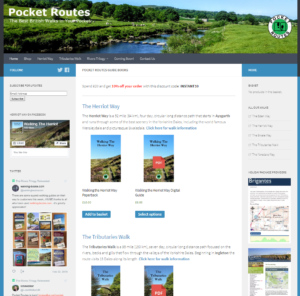 It’s great that there are two pubs in the village at all – there are larger villages along the Pennine Way that can’t support one, never mind two!